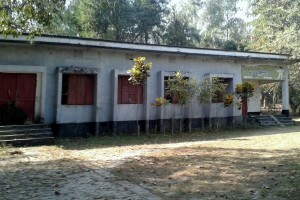 Aachranga Dighi has an overall area of 25.5 acres. This Dighi was excavated 120 years ago and it is 100 feet in length and 1070 feet wide. It is said that a guy named Monuvut of Raj dynasty excavated this Dighi. This Dighi was excavated again in 1992. 12 statues were found while digging this Dighi which are preserved in different museums. There are many trees present surrounding the Dighi. The surrounding environment is very pleasant. It is visited my many tourist every year. Address: Number 1 station Road, Joypurhat. Address: Sadar road, Adjacent to Joypurhat-Hilly road. Items: sweets, rice and different curries. Enjoy the natural site of the Dighi. If you are hungry you may search for restaurants or fast food shops nearby. You may also carry your own food. Alta Dighi is located approximately 56km away from Zilla Sadar. Its length is 1113 meters, breadth 42.81 meters and volume of 42.81 meters. It is a very attractive spot for the tourists. This is situated exactly near at the India-Bangladesh border at the North Bengal. There is a beautiful forest near the dighi. 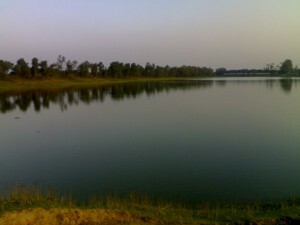 Mata Sagar is a large tank of Dinajpur. This is near to the "Dinajpur Rajbari". 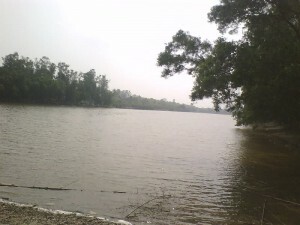 MataSagor is situated at the in Dinajpur town at Raja Rampur village. Once all banks of the water tank was covered with very high hills. Mata Sagor is more attractive than the Sukh Sagor, and they never dry at any season. Ramsagar is a largest man made lake of Bangladesh situated in the village Tejpur eight kilometer south of the Dinajpur town. The lake wide is about 1079 m north-south and length 192.6 m in East-West. Ramsagar was stablished in the mid-1750s by Raja Ram Nath. About 1.5 million worker took part to dig the lake and total cost is 30000 TK that time. The total area of Ramsagar National Park about 60 square km. Forest Department of Bangladesh have planted different type of ornamental and fruit trees that have flourished and become forested areas. Around the Ramsagar it is a familiar picnic place for tourists. 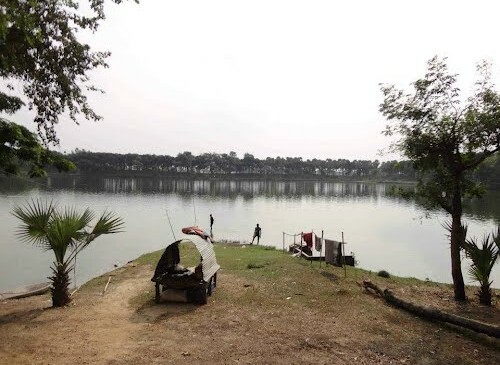 The Bangladesh Parjatan Corporation has improve some tourist facilities around the Ramsagar Lake, such as rest-rooms, picnic spots and kiosks to sell refreshments, as well as playgrounds for children to enjoy. The lake is full of different type of fishes. There have some fresh water crocodiles. In national park there has some animals such as Deer, Wild Boar, Blue Bull, Sloth Bear and Hyena. There some birds such as White-Breasted Water Hen, Jacanas, Moorhen, River Tern, Sand Piper, Ringed Plover and Grey and Purple Herons are seen. Moreover, the lake is a safe place for migratory birds. Whatever it is a place which is full of natural beauty. So government should give more concentration about the National park. 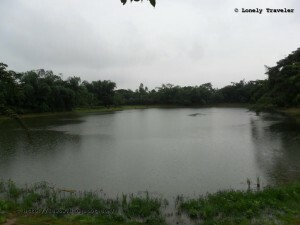 Bebud Rajar Dighi (বেবুদ রাজার দিঘী) is a large pond that is located at the Egarosindur Union (এগারোসিন্দুর ইউনিয়্ন) of Pakundia Upazila. Locally this is known as Bebud Rajar Pukur (বেবুদ রাজার পুকুর), more colloquially Bebuiddar Pukur (বেবুইদ্দার পুকুর). It was built by a tribal king named Bebud (বেবুদ). He belongs to the tribe named Koach (কোচ), many people opposed it as tribe Hajong (হাজং). Myth on Bebud Rajar Pukur: According to history described by the locals, Bebud (বেবুদ) was a tribal king of Koch tribe (কোচ উপজাতি) from the 16th century. There are several myths/stories are available regarding this king and his pond. During a drought, he dug this large pond to ease the water crisis of his peasants. But unfortunately the pond didn't filled with water. King Bebud (বেবুদ) saw a dream at night and heard a voice that ordered to sacrifice his wife's life at the pond to get water on it. He shared this dream with his wife Shompa Rani (শম্পা রানী) and his wife agreed to comply with the order of the dream, but she had a toddler and asked the king about his future. She was worried about his baby's life. Next day, during the dream, King Bebud (বেবুদ) saw the dream again and this time he asked about his toddler son. Cause the son was totally dependent on his wife. The voice on the dream assured that the King will be given a magical ring, if he bring this ring on the bank of the pond, his wife will be given back to him only to feed their toddler son. Assuring the safety of their son, the queen went at the middle of the pond at next day and the water started to rise slowly and she was sunken inside the water when a whorl was created around her. Whenever the kid cried from the hunger, the king brought him to the pond and touched the bank with his ring. It conjured the queen back as a form of human and she gave her breast to the baby.